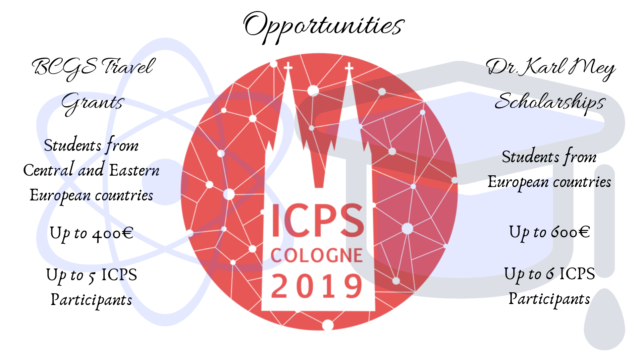 The ICPS 2019 Organising Committee (OC) has announced two opportunities for financial support in ICPS 2019 attendance. The Bonn Cologne Graduate School of Physics and Astronomy (BCGS) is supporting five Travel Grants, by reimbursement, of up to 400€ to cover conference fee and travel costs for students from Europe presenting a scientific contribution at ICPS. The Dr. Karl Mey Scholarships, established by the DPG to promote young scientist from Central and Eastern Europe, are supporting with up to 600€ for conference fee and travels costs up to six ICPS participants from Central and Eastern European countries presenting a scientific contribution at ICPS. To find out how to apply and to check if you can apply, read instructions here! If you can apply, don’t miss this opportunity!